Five Geothink researchers published a new paper in Transactions in GIS this past January that reflected on four years of research into how geospatial open data can impact the relationship between government, its citizens and the private sector. In their article published this past January, five Geothink researchers reflected on four years of research into how geospatial open data can impact the relationship between government, its citizens and the private sector. In it, they examine how geospatial open data poses challenges for civic participation related to subsidizing the private sector, being provisioned equally across geography and user type, and in increasing corporate influence on government. 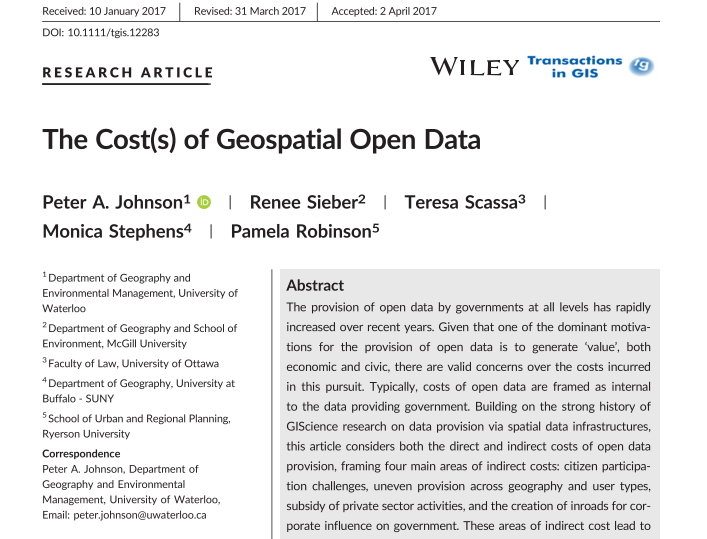 Published by Transactions in GIS, the article entitled “The Cost(s) of Geospatial Open Data” concludes with the development of critical questions to guide governments that provide open data in addressing costs related to constituency, purpose, enablement, protection, and priorities. A key table from the “The Cost(s) of Geospatial Open Data” which lays out the critical questions in each of these areas for municipalities. Johnson’s co-authors on the paper were Geothink Principal Investigator Renee Sieber, associate professor in McGill University’s Department of Geography and School of Environment; Geothink Co-Applicant Teresa Scassa, Canada research chair in Information Law at the University of Ottawa; Geothink Collaborator Monica Stephens, assistant professor at The State University of New York, Buffalo; and Geothink Co-Applicant Pamela Robinson, the associate dean for Ryerson University’s Faculty of Community Services and an associate professor in the School of Urban and Regional Planning. This entry was posted in Refereed Publications & Conferences and tagged cities, costs, costs of open data, guide, guide for cities, open data, open data provisioning, transactions in gis on July 19, 2017 by Drew Bush.